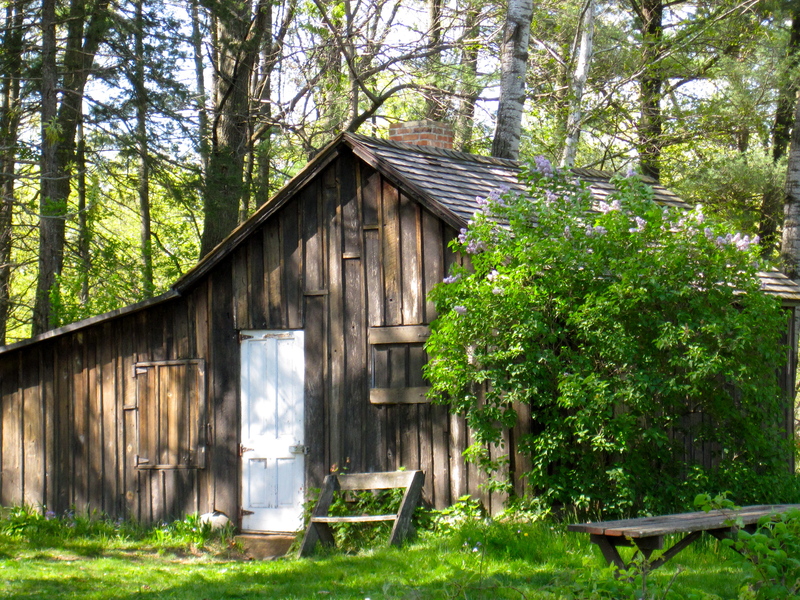 Since moving to Wisconsin, I have come, like many, under the spell of Aldo Leopold. I must admit with some embarrassment that less than a year ago I could barely have told you who Leopold was. But it’s not hard to get swept up by the Leopold legacy around here — in fact, there is a veritable cottage industry devoted to maintaining it. For the most literal Leopold experience, you can go to the Leopold Center and shack, as I recently did. 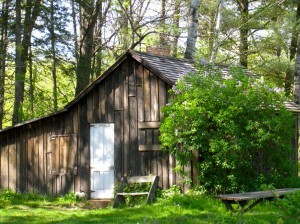 The shack, I discovered, is rather modest, and you can’t see in. The family outhouse–a.k.a. the Parthenon–is nearby (you can see in). You can easily confirm the farm was indeed built on a piece of sand, and you can walk out to the peaceful Wisconsin River. Some of the famous pines still stand tall, but in their understory other trees grow. Will the Foundation maintain the pines even when forest succession dictates their replacement? Then there’s also the unaffiliated Aldo Leopold Nature Center in Monona, which I wrote about in an earlier post. The UW-Madison Arboretum has the Leopold pines and a series of “Green Fire” signs exploring his contributions to the place–rightly so, since Leopold was one of the key forces behind the Arboretum’s creation. The magnificent atrium of Birge Hall, which houses UW-Madison’s Botany Department, features a display devoted to Leopold. If you take department member Don Waller’s ecology course, as I am, you will be read to from Leopold. Even the new Wisconsin Institutes for Discovery building features Aldo’s cafe, where you can enjoy your morning coffee while reflecting on timeless Leopold quotes. So that’s what we say about Leopold today–deep respect, perhaps a touch of hagiography. But what did Leopold himself say? To find the answer to that question, I bought A Sand County Almanac from a used book store for a dollar–probably one of the best deals of my life–and have been making my way through it in brief interludes from my course work. Two things strike me the most: one, how elegant the writing is (especially given that Leopold was trained as a forest manager, not a writer), and two, how fresh and relevant it is to us today. Today the Wisconsin grey wolf population has recovered to a little under 1,000. Meanwhile, deer populations in the state skyrocket, car-deer collisions are at record numbers, and Wisconsin native plants are being hammered by deer browsing in forests. And yet, the Wisconsin legislature has authorized a grey wolf hunt. The editorial board of the Wisconsin State Journal, a respectable newspaper, even makes the perverse argument that opening a hunt on the wolves will somehow help them. What have we learned in 65+ years? Admitting to such an ecological sin, and a rather brutal one at that, must have taken a lot of courage. The exhibit at the Leopold Center describes how it came about from a conversation with one of his formers students. For me, it burnishes the Leopold legacy as much as his many noble deeds and words. Beyond wolves, Leopold laments the diminishment of natural history in favor of rote memorization in biology education; the globalization of agriculture; the mechanization and gadgetization of outdoor pursuits. He celebrates several examples of what now might be called “citizen science”. He wishes we could see a right for biotic communities to exist, not just ask what their economic value is. All this seems to fit right in with today’s ecological issues. So again, what progress in the intervening years? I am beginning my ecological education. Even six months ago, if I went to the woods, I would have had a pleasant experience without much discernment of the specific components of my surroundings. And in some ways this is OK: simply walking in a forest, known in Japan as “forest bathing,” has been shown to reduce stress and boost immune function. But now the woods look different. I’m starting to recognize individual trees and other plants. I notice much more readily that some are invasive — and that garlic mustard is everywhere. I’m realizing how I’ve come to accept as natural that the woods I spend time in are full of young, slender trees, because I’ve so rarely (if ever) seen a true old-growth forest — ecologists call this the “shifting baseline” problem. I notice the conspicuous lack of wildlife, beyond small birds and mammals. It feels almost as though the woods are a diorama in a museum, to which large animals have yet to be added. Except that it’s not that the animals are waiting to be added, it’s that they’ve been subtracted. I realize ecologists have made great strides since Leopold’s day in grounding their discipline in empirical evidence and quantitative models; as a student I have had the opportunity to learn about some of these strides. But as a writer, and a nature lover, I also ask myself what broad ideas percolate up from all the complexity of the science, and I find that Leopold seems to have elucidated many of them 65 or more years ago. That Leopold’s insights seem fresh and new to me is as much a testament to my ecological ignorance as to his prescience. But I believe I’m no more ignorant than most who enjoy the outdoors — to say nothing of those who don’t. And if even those of us who want to protect “nature” are unaware of how unnatural today’s “nature” is, what chance do we have? I was recently invited to blog about a panel discussion at the Science Writing in the Age of Denial conference here in Madison. The session “Persuasive writing in a world of denial” was designed to help writers communicate effectively with readers who question scientific consensus. Panelists spoke about the need to understand their audience’s existing mental models, and to write stories that take those models into account. Click here for my full account of the discussion.